Chat tools are proven methods of online engagement and good forms of customer service. However, some are much better than others. Some chat tools are automated, some are manned overseas, and some are handled by in-house interns or lower-level sales reps.
ReadyChat is a chat services provider that has a focus on real estate agent websites. Its service is managed by its own in-house teams who are trained in driving potential buyers and sellers into your contact databases. I thought there would be no better test than to see how well they did that. 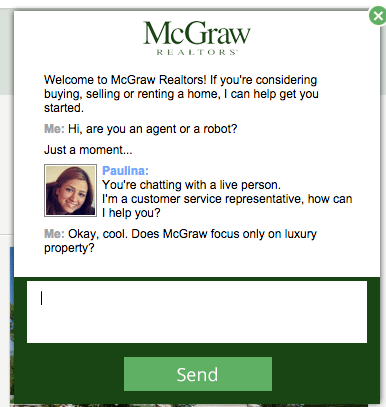 Welcome to McGraw Realtors! If you’re considering buying, selling or renting a home, I can help get you started. Me: Hi, are you an agent or a robot? Paulina: You’re chatting with a live person. I’m a customer service representative, how can I help you? Me: OK, cool. 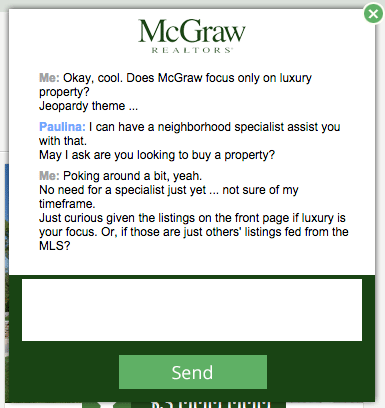 Does McGraw focus only on luxury property? Paulina: I can have a neighborhood specialist assist you with that. May I ask are you looking to buy a property? Me: Poking around a bit, yeah. No need for a specialist just yet … not sure of my time frame. Just curious given the listings on the front page if luxury is your focus. Or, if those are just others’ listings fed from the MLS? Paulina: If you would like to leave your requirements with us, I’ll have an agent do the searching for you. Can you tell me how many bedrooms you are interested in? Paulina: Great. Is there is a price range you would like to stay within? Paulina: And are you currently working with an agent to help you in your search? Paulina: If you would like to leave me with your name, phone number and email address, I can have one of our neighborhood specialists provide you with listings that best match what you’re looking for. Me: Again, just trying to determine if you focus only on luxury property, the front-page listings indicate as much. Paulina: I’m a customer service representative, but can have a licensed Realtor assist you with your needs. Paulina: Sure. Is there anything else you would like to mention at this point? Me: Nothing now, back to work I suppose. The page numbers on McGraw’s listing page suggest they have several thousand listings. All I wanted to know is if they focused only on luxury properties, and if all of those were their listings. And since I went into the chat to deliberately challenge my chat partner’s close rate, I can’t blame her for not being able to convert. In order to dive deeper into the ReadyChat skunkworks, I decided, what better way than to have a little chat with one of their reps? Below is the actual transcript from a chat I had with Alicia of ReadyChat on May 4, around 2:30 p.m.
Alicia: Thank you for visiting ReadyChat. How can I help you today? Me: Do you work only for real estate companies? Alicia: Anything real estate related. May I ask what industry you’re in? Me: So, commercial, rental property management, etc.? I’m in real estate technology. Alicia: Yes, we definitely cover those. Are you inquiring about becoming a reseller? Alicia: No problem [smile emoticon] May I have your website URL for our reference? Me: No emoticons please, we’re not cave dwellers. Inman.com. How do you qualify leads? Just, a contact sent to an agent? Or, is it somehow quantified as being a “warm” lead? Alicia: Our leads usually have double or even triple the conversion rate of regular Internet leads. This is based on independent studies. Therefore, it’s safe to say our leads are warm. We send the contact information in addition to the entire chat transcript to the agent. Me: Cool. I suppose if they’re coming to the site and engaging with content (chat) they are more than just tire kickers. Nice. What kind of training to your chat reps have? Alicia: Good customer service skills and a good understanding of real estate verbiage. Me: Gotcha. Is there a specific point in a conversation where they try hand off a chat to an actual agent? Alicia: Yes, once we get their contact details. The agent will then take over where we left off. Me: Ohhh, the agent takes over the actual chat? Alicia: No, they take over by phone or email (whichever method they prefer). Me: Right. How does your team know to which agent to send the lead? Or is it just forwarded to a general mailbox? Alicia: Most brokerages have a CRM (customer relationship manager) as well, which routes it to the appropriate agent. Me: Sweet, so you integrate with CRMs? Or is that on the agency’s end? Alicia: I believe we can integrate with almost all real estate CRMs out there. Me: OK, to what extent? Can a chat script be connected to a contact’s record in a CRM? That sort of integration? Alicia: The CRM takes only the contact details from the chat transcript. Me: Oh right … wouldn’t be worthwhile to have all the superfluous discourse. Do your chat teams use a form to enter in details or just in the body of an email? Alicia: It’s sort of like a table within the body of the email. Me: That makes sense … Do clients have specific chat reps assigned to their company, or do they work on different sites each day? Do your clients have a dashboard or account interface of some kind? Does it show leads, interaction details, etc.? Alicia: I’m not sure how things look on our clients’ side. I assume each one is probably different depending on their CRM. Me: Gotcha. And about teams or reps assigned to certain clients? Alicia: From a technical standpoint, it’s possible that specific agents would be assigned to specific clients, it would depend on the traffic of the website. I don’t know if our operating officer has anything like that set up for any client. Me: Last question … there are a lot of chat tools out there. Can you list a couple of differentiators of ReadyChat? Alicia: We’re the only managed one. Not only that, we’re the only real estate-managed one. Alicia: We do the chatting for the agents. Agents are always on the go. They can’t chat themselves 17 hours a day. Me: Well, they could if someone would listen, I assure you. (Kidding, of course.) So most tools are manned by the actual users? Alicia: The chat software is manned by our chat agents. May I ask your position within Inman? Me: Technology review columnist; daily for Select members. Alicia: Nice! May I have your name as well for our reference? Me: Sure can: Craig Rowe. Thanks for your patience, and answering all of my questions. Alicia: Of course. Not a problem. Me: By the way, I’ve left Wendy hanging in the window over at Cressy Everett Real Estate … better tell her I’m not interested in any real estate today. Alicia: lol. Thanks, I will pass along your message. Me: Thanks again Alicia. Happy chatting. And remember, no emoticons. Let’s all make change together. Alicia: It comes across friendly and increases conversion rate. That’s how ReadyChat works. More or less. Chat tools do increase the number of website visitors who become contacts. Turning them into clients is up to you. 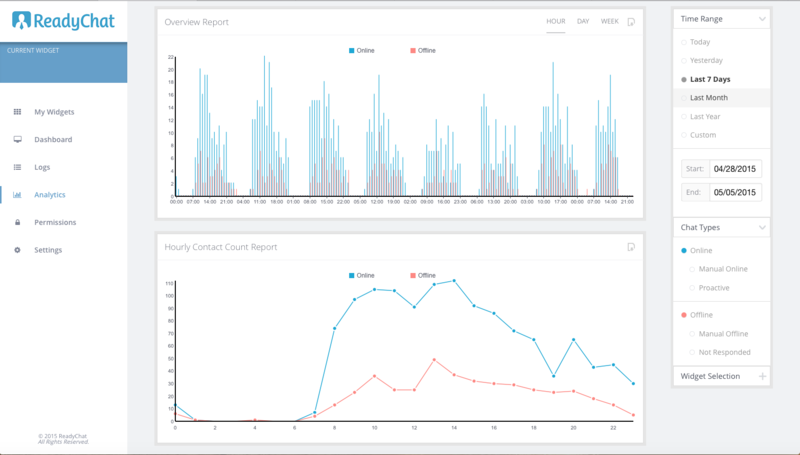 ReadyChat has some nice reporting capabilities for users to examine the efficacy of their chat team. ReadyChat is focused on real estate, so that’s a bonus among the many tools among its ilk throughout the greater business world. Plus, as Alicia stated, it’s completely managed. ReadyChat is priced per lead, starting at $8 per lead, up to 250. Agencies aiming for 1,000 leads will spend $5 per lead. This means the reps are motivated to convert, a structure real estate agents can relate to. Lastly, engagement tools like an active chat are much, much (endlessly, in fact) more effective than those auto-play talking-person-in-the-corner videos. Please, make that stop. It’s 2015. It’s no longer innovative. Anyway, if you want to better engage with website visitors, give ReadyChat a call. Ask for Alicia. 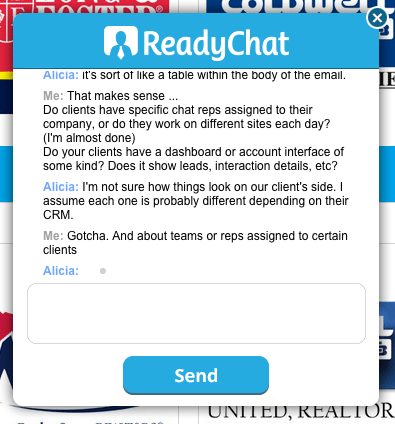 Do you use ReadyChat? What do you think? Leave a comment and let us know!